In America, February 2nd is “Groundhog Day”. If you’re not familiar with this celebration, I suggest you watch the Bill Murray movie, Groundhog Day (1993). If you’re not familiar with this celebration, I suggest you watch the Bill Murray movie, Groundhog Day (1993). Either you have seen the movie, and you get what I just did there, or when you do see it, you’ll get it. Again. And Again. I may be the only one giggling right now, but that’s okay. I’m used to my sense of humour. Groundhog Day is centered in the borough of Punxsutawney, Pennsylvania (from the Indigenous Put’schisk’tey, which means “poison vine”). Every year, on February 2nd, people gather to see whether or not Punxsutawney Phil, the celebrity groundhog, will come out of his den after a long winter sleep to look for his shadow. If he sees it, he regards it as an omen of six more weeks of bad weather and returns to his hole, but if the day is cloudy and he does not see his shadow, he takes it as a sign of spring and stays above ground. Why and how Phil got his celebrity status is a long folk tale, but it means he gets all the media attention while all the other groundhogs are peacefully poking their noses out of their dens and making the same decision. They’re probably happier to have the peace and quiet. The groundhog, also known as a woodchuck, whistle-pig, or land-beaver in some areas, is a rodent belonging to the group of large ground squirrels known as marmots. Their habitat extends from Georgia to Alaska, but they are more commonly found in the Northeastern and Central United States and Canada. 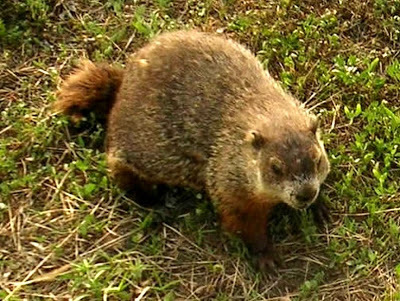 Of course this means that the signs of spring can be evident to groundhogs in some parts of the country, and not in others. Groundhog Day has its beginnings in ancient Celtic times when as part of the cross-quarter period (which could be two weeks long) known as Imbolc, folks sought to divine the coming weather by looking to see if badgers and snakes were coming forth from their winter dens. The Cross Quarter Days are the ancient festivals that fall in between the festivals on the two Solstices and the two Equinoxes. The Solstices and the Equinoxes form the “quarters” and the days the fall in the middle of them are the “cross quarters”. In this instance, Imbloc is now centered upon the January 31 – February 1 day, sundown to sundown. In Gaelic Ireland, where the Scots first lived, Imbolc was the feis (“festival”) of spring. The word Imbolc either comes from the Old Irish i mbolc (“in the belly” referring to pregnant ewes getting ready to lamb) or the Old Irish imb-fholc (“to wash or cleanse oneself” referring to the ritual spring cleaning). The timing of the festival was centered on the lambing and the blooming of the blackthorn, known as the Mother of the Woods and/or The Crone of the Woods. Imbolc is the time when the Divine Crone of Gaelic tradition, the Cailleach, gathers wood for the fire for the rest of the winter. If she wants to make winter last longer, she goes out into the sunny day of Imbolc to gather more wood for the rest of winter to come. If the day is cloudy, then she is sleeping instead of gathering wood, and the days of winter are almost over. Cailleach is reborn in the spring as the Maiden of Spring: Bride in Scotland, Brigid in Ireland. As for Phil, I don’t know how things are in Punxsutawney today, but here in Northern California they are cloudy and windy. Not that we had much of a winter, but that’s another story. This entry was posted in Ancestry, Eco-travel, Ecology, Land trust, Scotland, Scottish ancestry, Travel, Uncategorized and tagged Celtic Ritual, Groundhog Day, Imbolc. Bookmark the permalink.